Ah, curves. Some of us have them, some of us don't. Some of us would like a little more junk in the trunk, some of us moan on repeat about slimming down. Whichever camp you fall into, there are certain outfits that both work hard to embrace and optimise curves, as well as create the illusion of shapeliness. If you're straight up and down, there are some great tips to take from women who have learnt to dress voluptuous bodies and vice versa. Perhaps you've felt too voluptuous to wear certain items, and we're here to blow those myths right out of the water. 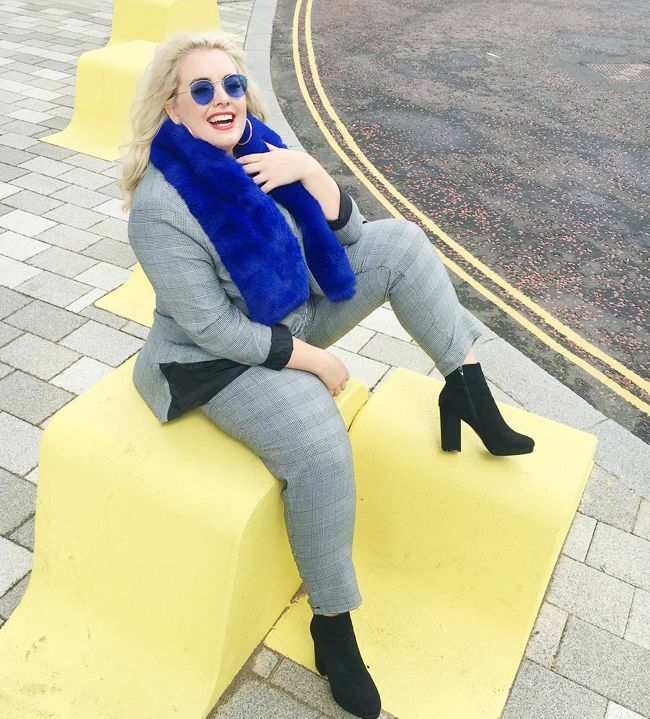 @felicityhayward; PICTURED: Model Felicity Hayward knows that River Island's plus-size suits are very popular for a reason. I'm certainly no supermodel myself, so over the years I've managed to work out what does and doesn't suit my more hourglass shape. There's no one formula to fit all bodies, and there's no one formula to fulfil the nuances of our individual, personal tastes, but there are a few handy formulas that some of the coolest curvy girls we know rely upon. So keep reading to see these trusty outfit combinations, and shop the key piece for each. Style Notes: Aglae's super-cute minidress is the ideal shape for girls who want to show off their waists and wear something with a short hemline. A-line skirt styles and two-tone pumps are both dead certs for flattering legs of all shapes, sizes and lengths, so it's a highly confident combination. This cute dress goes up to a size 22. Style Notes: Trust Beyoncé to have this casual look perfected. Jeans are best worn with a higher rise (that always elongates legs and highlights your waist), and while high heels make some of us feel more confident, this look totally works with flats. The figure-hugging base layers mean an oversized duster coat won't swamp your body. Foil curtain optional. Discounted and the perfect indigo wash? Count us in. Style Notes: Not only is wearing one colour head-to-toe a trick for looking taller for any petite girls out there, but it's also damn powerful too. Dresses that have ruching details are also great for making the most of curves or even creating them if you don't have them—you can often tighten in the places you want to, and then loosen in others. We're stealing this festive look from Naomi Shimada right away. The celebrity pick du jour. Style Notes: A crop top and pencil skirt look cracking on everyone. Revealing the smallest part of your body and being an outfit that works for all kinds of events, this is a dream formula to lean on. Take Ashley Graham's tip, and wear yours with metallic sandals this holiday season. Even better when your co-ords come in this suits-everyone shade of red. Style Notes: Jada Sezer's created a far more interesting way to wear a basic pair of black jeans and a white tee—the flattering addition of a corset belt not only looks sassy, but it also helps smooth the line between jeans and a T-shirt. Style Notes: Erica Davies has just solved the workwear conundrum for December. Her waist-nipping culottes are just right for a chunky knit to be tucked into, and even with mid-heel shoes, you'll feel instantly pulled together. Thank you, ED! Who says you have to opt for a classic Breton? Style Notes: If you ever feel like blazers hide your curves, then simply take Ada Oguntudo's styling hack, and cinch one at the waist. Looks particularly good for a slinky midi dress and longline pull-on boots. The boxy shape is great for belting up. Style Notes: This long tube style (in a decent fabric—flimsy jersey doesn't flatter anyway) is the dream ticket for both maximising curves and creating them if you want to look more voluptuous. Iskra Lawrence's dress style naturally lends itself to heels, as it has a going-out vibe, but it can be equally cool with sneaks on a more casual day. It always looks most Jessica Rabbit–esque when the hemline cuts above the ankle. Style Notes: If you've ever felt a bit daunted by PJ dressing, I'd highly recommend opting for a belted shacket style—it's much more flattering on all body shapes, thanks to fastening across the waist rather than hiding it. This means you can go wild with prints and colours, but we're just as into Hayley Hasselhoff's chic all-black version. These co-ords are still in the Black Friday sale—but they won't be for long. Style Notes: Charlotte Kuhrt is a woman after my own matchy-matchy heart. Tuck any elaborate sweater into your waistband, and that waist-bulk a knit can bring will be minimised. So awesome that these go up to a size 18. Next up, introducing our favourite plus-size bloggers.